We are a manufacturer, supplier and Exporter of Table Top Lyophilizer. We are offering our products in wide range of specification according to the industrial standard. Our product has longer life and durability. 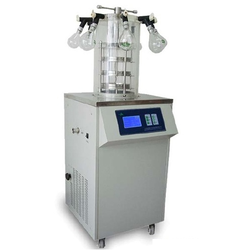 Table Top Lyophilizer is applicable for freeze-drying test of laboratory samples and suitable for small amount of production. FD-10-MR include the following types: Regular type, Top-press type, multi-manifold T type and multi-manifold Top-press type. 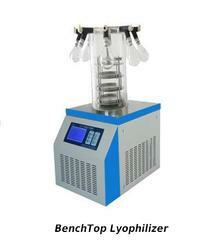 Bench Top Lyophilizer is applicable for freeze-drying test of laboratory samples and suitable for small amount of production. 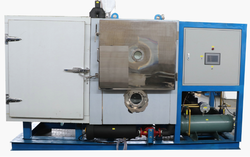 FD-10-MR include the following types: Regular type, Top-press type, multi-manifold T type and multi-manifold Top-press type. This is our 10kg freezedryer with insitu freezing and drying of your food, cut fruits, vegetables, microbial cultures etc. We manufacture this machine with utmost care with high quality refrigeration and condenser with vacuum pump to meet you demand for a pilot scale or scale up processing for industrial freezedrying.